Initially after the government shutdown ended, the BEA came out with release dates for a few unimportant economic reports from Q3. Bad news is this new schedule could be meaningless if the government shuts down again. Deadline for a shutdown is February 15th. Latest negative headline on the potential for a government shutdown came from Vice President Pence. He said the last shutdown wasn’t a mistake and he can’t guarantee there won’t be another one. Since 1999, this percentage threshold has been reached 3 times. Two if these times the economy entered a recession soon after. It’s possible the difference between the 30 yield and 3 month yield as well as the difference between the 10 year yield and the 2 year yield have already troughed. As of Wednesday’s close, the 10 year yield is at 2.69% and the 2 year yield is at 2.52%. It’s possible the 11 basis point difference between the 10 and 2 year in December was the bottom instead of an inversion being the bottom. We’d need to see much more than the 6 basis points of steepening to conclude this. Whether the curve is starting to steepen or is still flattening affects the business cycle’s timeline. If the curve were to steepen sharply, a recession would be afoot in the next 6 months. Recession - If the curve is still flattening, a recession is over 1 year away. There are still 17 basis points left before an inversion. The curve can stay inverted for a few months. Then it will steepen. and a recession will soon follow. In looking at the economic data, I don’t see a recession occurring in 2019. 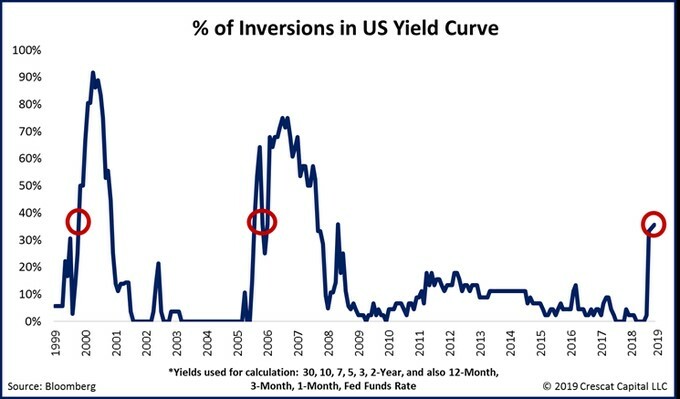 Meaning, I’ll be looking for the 10 year 2 year curve to flatten in the next few months as I expect an inversion to occur in the first half of this year. 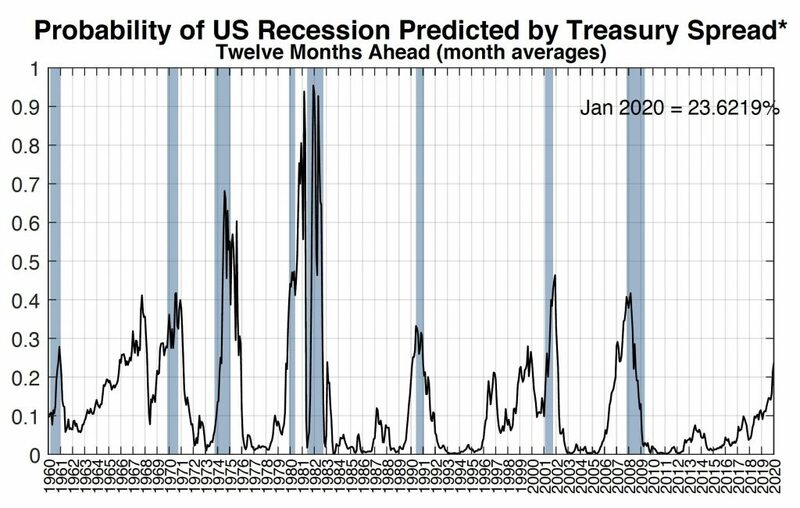 NY Fed’s recession indicator uses the treasury spread to forecast the odds of a recession in the next 12 months. The chart below shows there’s a 23.6% chance of a recession by January 2020. In theory, I would agree with these odds because they are relatively low. However, this indicator isn’t like normal odds as only one previous recession had odds above 70%. Odds of about 40% almost guarantee a recession is coming soon. There even was a recession in 1960 where the odds didn’t get to 30%. The biggest false indicator this metric had was when the odds increased above 40% in 1967 even though there wasn’t a recession until 1970. With this understanding, I don’t agree a recession is coming soon. The Fed is dovish, manufacturing is accelerating, and the consumer is strong. The consumer has deleveraged this cycle and is seeing real wage growth accelerate. Inflation has moderated. I don’t see an obvious reason for a recession in the near term. Oil prices have rebounded since December, which suggests oil won’t catalyze economic weakness like it did in 2015-2016. The banks are in much better shape than last cycle. Finally, the housing market has begun to recover in the beginning of 2019 because price growth slowed and interest rates have fallen. To be clear, this housing recovery is still uncertain, but it is a green shoot. MBA mortgage applications composite index for the week of February 1st fell 2.5% week over week after falling 3% in the previous week. The purchase index fell 5% after falling 2% in the previous week. Refinance index was up 0.3% after falling 6%. Unadjusted purchase applications were down 2% year over year. The average interest rate on 30 year fixed mortgages fell 7 basis points to 4.69% which is the lowest rate since April 2018. Last week included MLK day so the results may have been altered. This latest week didn’t include a holiday so it’s more likely to be accurate. It signals demand started to fall off after spiking earlier in the year. According to Realtor.com, in 39 out of the largest 50 housing markets, the percentage of housing price cuts increased in January. Las Vegas saw the largest jump, at 16%. That’s interesting coming from one of the hottest housing markets. San Jose price cuts were up 9%, Seattle’s were up 8%, Orlando’s were up 6%, and Phoenix’s were up 5%. These price cuts explain the increased demand in January. Some realtors acted surprised by the increased home sales growth in January. It’s like they figured the cycle was over. Real wage growth is strong and job creation is strong, so when prices get cut and interest rates fall, demand will increase. This is just like how retail investors thought the cycle was over in December. The cycle didn’t end because the Fed became more dovish and optimism about a potential trade deal increased.